Operating Era: 1949-1960. Recommended Trucks: Tahoe TMW-212 Andrews. These Express cars were rebuilt by NWP from their 100 USRA DS box cars in 1939. See Our Kit #3818 for that version. After WWII, the NWP repainted the cars with a colorful "Redwood Empire Route Overnite" banner down the length of the car. 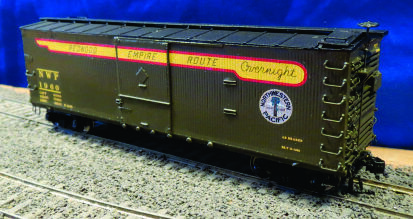 Our Kit features the full color lettering, AB brakes, an improved One-Piece body, passenger steam, signal and air lines, etched sill steps and many other details. NOTE: A PDF file color photo of NWP #1960 is available with this Kit. Email Required. This series of Kits is also available with Tahoe trucks (Code 110 or 88 wheels) and Kadee couplers (#5 or #158). Please see Kits #12481 or 12482. Please also see our KIT #3818 for the Original Version of the USRA DS Box/Express car (1919-1946), and, Kit #3858 for the NWP USRA DS Box cars from 1946 to 1960. Decal sets available separately also. PLEASE SEE OUR NEW KIT RELEASES SECTION FOR MORE INFO ON THE #12400 SERIES KITS.